One recipe usually makes one type of food - this is pretty much common sense. But if you change out a couple of ingredients, this recipe will turn a savory treat into a sweet one. 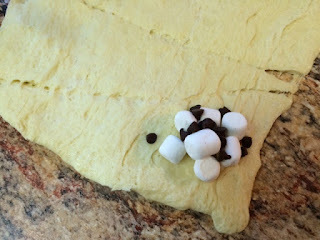 You'll start with two cans of crescent roll dough and end up with a great appetizer and a decadent dessert. 1. Preheat oven to 375 degrees. Spray baking sheet with nonstick spray. 2. Pour sauce and meatballs into a medium pan and simmer until warm, about 10 minutes. 3. 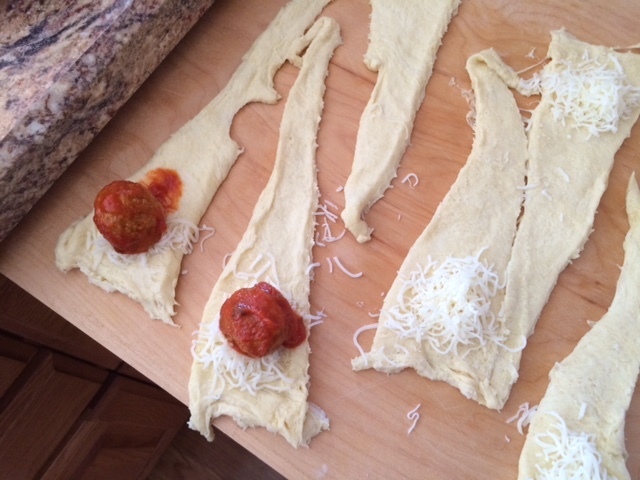 Unroll dough and separate at the perforations. For large crescents, use entire triangle. For smaller crescents, cut each triangle in half. 4. Place small mound of cheese on each triangle and top with a meatball and a small amount of sauce. Roll up and place on baking sheet. 5. Bake at 375 degrees for 18-20 minutes, until the dough has turned golden brown. 2. Unroll dough and separate at the perforations. For large crescents, use entire triangle. For smaller crescents, cut each triangle in half. 3. Place small mounds of marshmallows and chips on each triangle. Roll up and place on baking sheet. 4. Bake at 375 degrees for 18-20 minutes, until the dough has turned golden brown. 5. Serve drizzled with chocolate and caramel sauce. You can also play around with different ingredients. Try sliced mozzarella cheese in the meatball crescents and marshmallow fluff in the S'mores crescents.